Palais des Nations in Geneva, Switzerland. 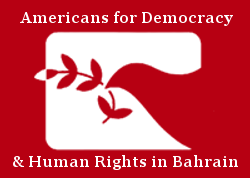 Geneva, Switzerland – From 10 September to 25 September 2018, Americans for Democracy & Human Rights in Bahrain (ADHRB) participated in the 39th Session of the United Nations (UN) Human Rights Council (HRC) and highlighted widespread human rights violations committed by the Governments of Bahrain, Saudi Arabia, and other Gulf Cooperation Council (GCC) States. ADHRB delivered 19 oral interventions, and hosted two side events in cooperation with the Gulf Centre for Human Rights (GCHR). Many of the human rights concerns raised by ADHRB were echoed by UN officials, NGO representatives, and State Representatives. Legal Fellow Annabel Bassil preparing to deliver an oral intervention. 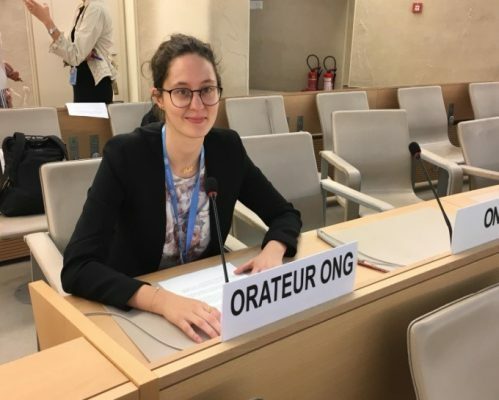 On 10 September, HRC began and ADHRB’s Advocacy Fellow, Monica Zuraw, delivered an oral intervention highlighting failing labor practices, human trafficking, and migrant labor violations in Bahrain. In the intervention, ADHRB criticized unwarranted praise from the United States regarding Bahrain’s labor migration practices, calling on the UN Special Rapporteur to request a country visit to Bahrain to independently evaluate the situation in the country. Annabel Bassil, a Legal Fellow at ADHRB, also delivered an oral intervention during the Item 3 Clustered Interactive Dialogue with the Special Rapporteurs on the rights of older persons and on water and sanitation. ADHRB raised Hassan Mushaima’s case, highlighting that he is serving a life sentence in Bahrain’s Jau Prison where he has been denied crucial medical care for a myriad of health conditions. ADHRB called attention to other abuses and cruel conditions in Jau Prison like the Bahraini authorities’ decision to cut off the water supply to the prison. 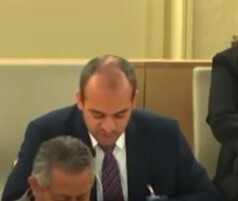 The next day, ADHRB Director of Advocacy Michael Payne delivered an oral intervention during the Item 2 General Debate on the oral update by the new High Commission for Human Rights, Michele Bachelet. In its remarks, ADHRB raised concerns over widespread arrests of women’s rights activists and human rights defenders, as well as the continued suppression of the right to free expression, assembly, and association. In particular, attention was called to the cases of Samar Badawi, Naseema Alsada, Loujain al-Hathloul, Omar al-Said, Salman al Awda, and Mohammed al-Bajadi. Additionally, ADHRB, in cooperation with the Gulf Centre for Human Rights (GCHR), hosted a side event on Saudi Arabia’s upcoming Universal Periodic Review (UPR). Salma al-Hosseiny from the International Service for Human Rights (ISHR) moderated the event, which featured Yahya Assiri from ALQst, Manon Karatas from the International Federation of Human Rights (FIDH), Khalid Ibrahim, the Director of GCHR, and ADHRB’s Director of Advocacy, Michael Payne. The discussion focused on women’s rights, the criminalization of free expression, the war in Yemen, and other Saudi human rights issues in advance of its November Universal Periodic Review (UPR). Panelists at the ADHRB and GCHR side event on Bahrain. On Wednesday 12 September, ADHRB hosted another side event in cooperation with the GCHR. Susan Wilding from CIVICUS moderated the event, which featured Special Rapporteur on the freedom of peaceful assembly and association Clement Nyaletsossi Voule, Chair of the Bar Human Rights Committee Kristy Brimelow, Khalid Ibrahim, Director of GCHR, and Monica Zuraw, Advocacy Fellow at ADHRB. The discussion focused on the repression of freedoms in Bahrain, including freedoms of expression, association, and assembly. Advocacy Fellow Monica Zuraw preparing to deliver an oral intervention. On the same day, Michael Payne delivered an oral intervention during the Item 3 Interactive Dialogue with the Working Group on Arbitrary Detention. 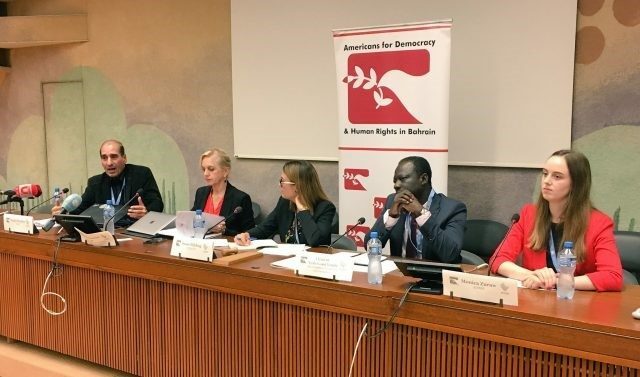 ADHRB raised the issue of arbitrary detention and torture in Bahrain, highlighting enforced disappearances, mass trials, and due process violations by the government. 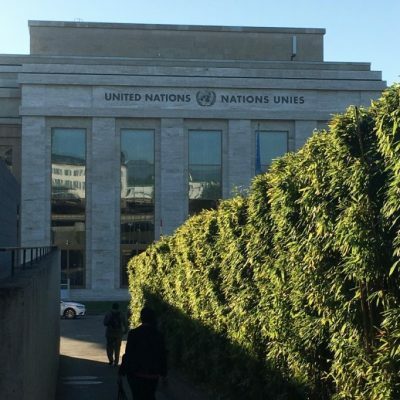 The intervention thanked the Working Group for its recent opinion on Nabeel Rajab’s case, and additionally raised the case of Hassan Mushaima and his denial of medical treatment while arbitrarily detained. The second oral intervention that ADHRB delivered that day was during the Item 3 Interactive Dialogue with the Working Group on the use of Mercenaries. In this intervention, ADHRB raised the issue of sectarian discrimination and foreign recruitment in Bahrain’s security forces, highlighting institutionalized religious discrimination against the indigenous Shia Baharna majority of Bahrain. The intervention also called attention to the recruitment of foreign personnel for the security forces and the government’s offers to expedite citizenship for foreign personnel. The following day, Monica Zuraw delivered an oral intervention during the Agenda Item 3 Clustered Interactive Dialogue with the Special Rapporteurs on the right to development and on unilateral coercive measures. In the intervention, our fellow raised concerns about Bahrain’s progress towards its Sustainable Development Goals and how this progress is being undermined by the government’s own practices of discrimination, political repression, and severe restrictions on human rights. 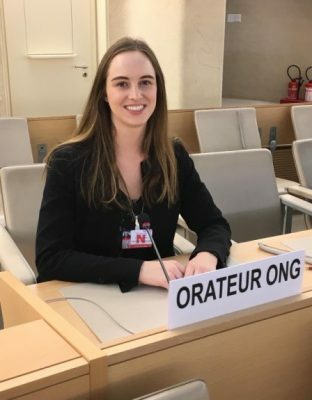 ADHRB Legal Officer Bridget Quitter waiting to deliver an oral intervention to the Human Rights Council. On Monday 17 September, ADHRB’s Legal Officer, Bridget Quitter, delivered an oral intervention during the Agenda Item 3 General Debate. In the intervention, ADHRB presented a letter received from an arbitrarily detained prisoner in Bahrain’s Isa Town Women’s Prison detailing ill treatment and poor conditions. 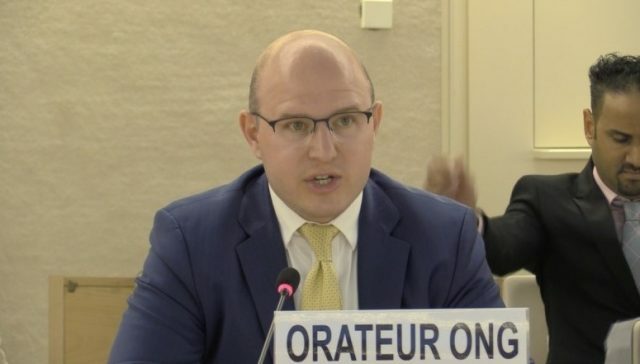 ADHRB’s Director of Advocacy, Michael Payne, delivered another oral intervention raising concerns about Bahrain’s continued restrictions on Hassan Mushaima and other high profile political prisoners, including restrictions on access to healthcare. Ali Adubisi delivers an oral intervention on attacks on women’s rights defenders in Saudi Arabia. On Tuesday 18 September, ADHRB delivered three oral interventions. 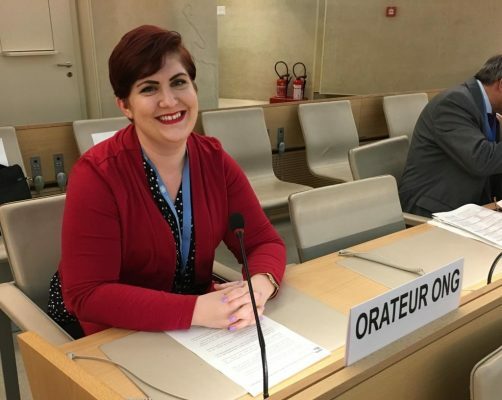 The first was by Bridget Quitter during the Item 4 General Debate calling the Council’s attention to the rising political repression surrounding Bahrain’s upcoming parliamentary elections in November 2018. The second oral intervention of the day was under the Item 4 General Debate once again calling attention to the poor conditions in Bahrain’s Jau Prison – the kingdom’s primary long-term detention center. In particular, ADHRB raised concern about the unsanitary conditions of cells, reprisals against activists, and punitive collective punishment measures. The third intervention on this day was delivered by Ali Adubisi of the European Saudi Organisation for Human Rights (ESOHR) during the Item 4 General Debate. In his intervention, Adubisi dismissed Saudi Arabia’s claims to reform, noting the proliferation of institutions empowered to restrict rights and enable oppression, while also calling attention to continued attacks on women’s rights defenders and the targeting of human rights organizations. On 19 September, during the Item 5 General Debate, ADHRB delivered an oral intervention discussing reprisals in the context of the UN Secretary-General’s recently released report. The intervention focused on reprisals by the Bahraini government against human rights defenders and their families, and noted in particular cases concerning Ebtesam al-Saegh, Sayed Ahmed Alwadaei, Nabeel Rajab, and Nedal al-Salman. On Friday 21 September, during the Agenda Item 5 General Debate ADHRB delivered two oral interventions. The first involved reading a portion of a letter written by Hajar Mansour Hassan, an arbitrarily detained Bahraini reprisal victim cited in the Secretary General’s report on reprisals. The letter details Hajar’s arrest, interrogation, and torture, which the security forces used as a way to pressure activist Sayed Ahmed Alwadaei from continuing his activism. In the second intervention on this day, ADHRB discussed Bahrain’s membership bid for a seat on the Council, calling attention to Bahrain’s poor human rights record and abysmal record of cooperation with the Council and its mechanisms. Director of Advocacy Michael Payne delivers an oral intervention. On the following Monday during the Item 6 General Debate, ADHRB delivered two oral interventions. 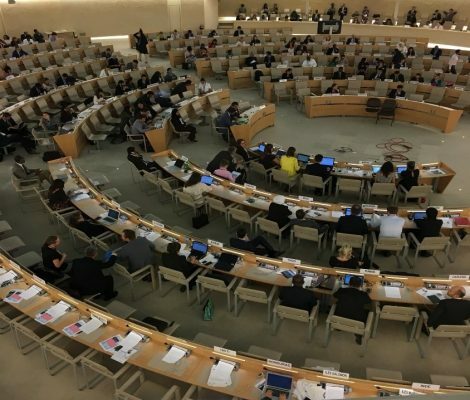 The first intervention raised concerns about the United Arab Emirates’ continued violations of human rights and its refusal to implement their second-cycle UPR recommendations. In particular, the intervention called attention to cases of free expression, migrant rights, and torture. ADHRB’s second intervention drew attention to Saudi Arabia’s ongoing and widespread human rights violations, along with its refusal to reform despite having pledged to implement dozens of recommendations that would grant Saudi citizens great social, political, and economic freedoms. On Tuesday 25 September 2018, ADHRB delivered an oral intervention, raising concerns over ongoing discrimination perpetrated by the Bahraini government against the country’s majority Shia population. This discrimination affects nearly every aspect of life, ranging across religious, social, political and cultural rights, and is marked by the government’s targeting of Shia leaders and clerics. ADHRB delivered its final oral intervention during the Item 8 General Debate, focusing on the follow-up and implementation of the Vienna Declaration and Programme of Action. The intervention addressed concerns over States’ violations of the Declaration relating to impunity and failure to prosecute state actors who violate the Declaration, in particular Bahraini security forces, who rarely face negative consequences for torture and extrajudicial violence. On Friday 28 September 2018, on the final day of the Council, the HRC passed, by a vote of 21 for, 8 against, and 18 abstentions, to extend the mandate of the Group of Eminent Experts in Yemen for an additional year. The successful resolution, supported by Netherlands, Belgium, Canada, Ireland, and Luxembourg also requests the Office of the High Commissioner for Human Rights to continue to provide substantive capacity-building and technical assistance to the National Commission of Inquiry, and for the High Commissioner to present an oral update at the 40th session of the HRC in March 2019. This ensures that the situation in Yemen will remain on the agenda throughout 2019. ADHRB welcomes the extension of the mandate of the Group of Eminent Experts in Yemen and is appreciative of the continued discussion surrounding the harrowing war in Yemen. To conclude, ADHRB would like to note the 39th Session of the United Nations Human Rights Council marks the eighth consecutive Council session in which cases of reprisals against civil society members in relation to the work of the Human Rights Council have been reported. Bahrain’s history of implementing widespread travel bans affecting a wide range of civil society actors has unfortunately continued through 2018.